I arrived to the elder’s meeting 15 minutes early and since these guys have lots going on in life, I was the only one there, early. This gave me some time to think things through. You see, I’m a visual learner and it’s the way that I best communicate. I combined the concept that I read in some of Pat Morley’s Man in the Mirror ministry and combined with some concepts for maturity models I have as a senior IT leader. Here is the conclusion that I came to – since I’m visual, I will drop the image here first and then unpack it. Along the top, we have momentum. For our church, this is the incremental involvement from our people reflected in how they serve. Some time ago, we ‘Created’ momentum by holding events; such as Sunday Service or Bible Studies or outreach events. But from there we looked to ‘Capture’ that momentum. The whole reason we do these events (for lack of a better word) is to build relationships and grow the depth of the people serving while meeting real needs doing God’s work. And we create bridges from those events to capture that momentum to go deeper. After a men’s talk, we offer a time to join a small group. After Sunday Service, we offer places for people to plug in, to grow, to go deeper. You get the point. Finally, we look to sustain that momentum. This is the time where you identify and develop leaders who can then reach back out to create, capture and sustain momentum. Chaos – Things here are unorganized and uncontrolled. There is little to no structure. When things catch fire, they burn out. Create. The upside to this level is that people can do almost anything to spark or ‘create’ momentum! This is a very exciting time for some people (those social extraverts and a frustrating time for other (those perfectionist and process types). Capture. However, if an organization or church’s maturity level is at Chaos and they want to reach the next level, Capture, it is not possible (or if so, then really really hard to do – you end up burning out those couple people who are ‘doing it all’). Sustain. The same point here. A church can’t be in Chaos if they want to sustain momentum. There is no solid foundation on which to build. Reactive – Here the church is firefighting. There always seems to be a fire somewhere, but at least those fires are getting fought. Here we try to contain those areas that have problems and things are thought from a tactical perspective. Create. Creating momentum when the church is reactive is good. That momentum created meets people closer to their real needs. Capture. And when the church is reacting, they can do a decent job in capturing that momentum. Here folks are trying to react to the impact of the momentum – trying to find places for folks who seem to want to serve. Sustain. 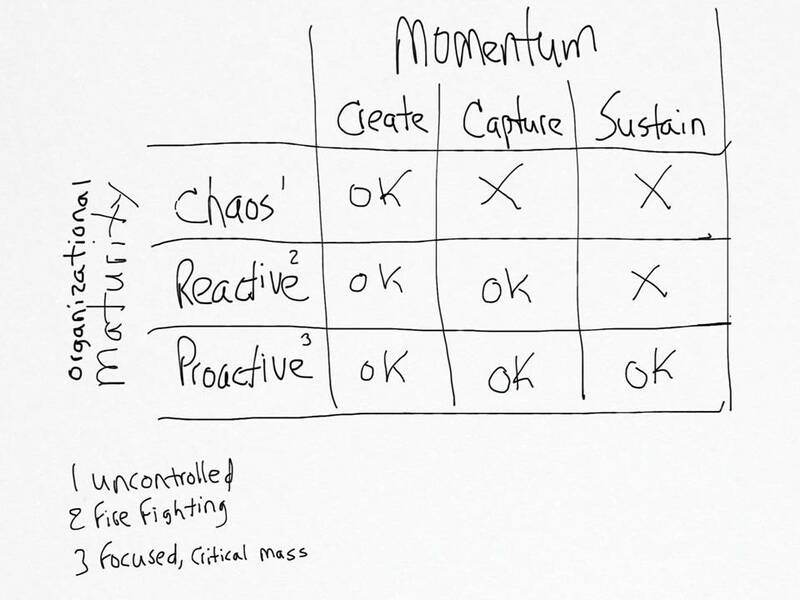 However, when the reactive church looks to sustain that momentum, they are not in a position to do so because they are tactical and not strategic. Simply put, they are focusing on the reaction to the momentum and not focusing the momentum back into their vision. Proactive – A proactive church is one that has a vision and a plan that is real and they are on focus. If your leadership and folks serving know the vision and know the plan, if the organization is clear and the leaders are visible and approachable, if the role of folks serving is clear and communication is happening, then the church may be in the proactive level. Create. The challenge for a proactive church during the create level is that they may lose their spontaneity. The answer here is that we need to plan for spontaneity – we need to allow natural and organic momentum to be created! Capture. The good news here is that there are mature processes that are well known to capture the momentum – to bridge people to deeper levels of relationship with God, with others. Sustain. And really, the whole point of this article is to say that if you want a healthy church that can grow and scale over time, then you need to be at both places! The church needs to be proactive – this provides the organizational foundation to execute, to get things done. It provides the accountability, the process, the clarity, the direction… The church needs to sustain the momentum – this provides the building up of leaders who disciple others and lead them into deeper relationships with God, with others. August 29, 2013 in Church Growth, Leadership.